A total of 17 prizes were awarded at the event with the winning schools announced at an event in Edinburgh on Wednesday and included Caol Primary School. Caol Primary scooped the School and Community Partnership Reading Journey for their “fantastic efforts” in engaging their entire community in the school’s reading initiatives. They developed successful partnerships with families, local businesses, the local library and authors while creating imaginative, inclusive initiatives to celebrate their love of reading. The Caol pupils were given the award for School and Community Partnership Reading Journey – National Winner and the award was presented by First Minister Nicola Sturgeon herself. 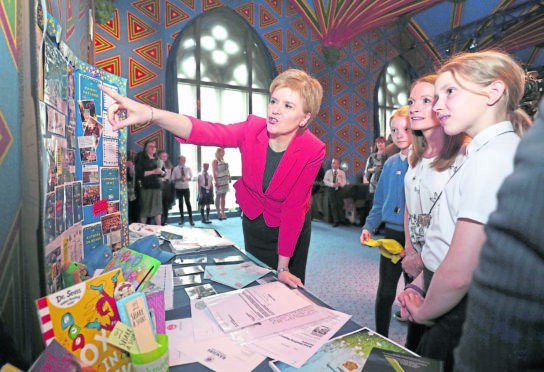 The First Minister’s Reading Challenge was launched in 2016 initially for primaries four to seven was expanded to include all primary age pupils. Literacy Coordinator at Caol Primary Kerry Lamont said: “We were delighted to take part in the First Minister’s Reading Challenge and have been busy promoting reading for enjoyment in a variety of ways with support from staff, pupils, families and the wider community. First Minister Nicola Sturgeon said: “Raising attainment is at the heart of the Scottish Government’s work.